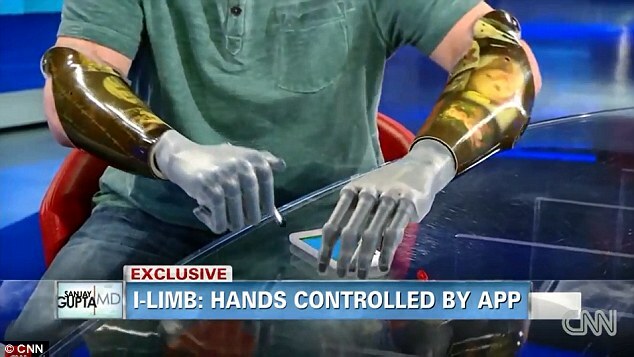 The i-Limb Ultra Revolution: an app controlled bionic hand. Do you need a bionic hand capable of using opposable thumbs; of picking up small things, and of doing a handshake? You can read more about this breakthrough here. This entry was tagged Chapter 45: The Skeletal System, technology, video. Bookmark the permalink. After watching this video I couldn’t help but to wonder off into one of the related videos called dark lightning. Honestly that is something that would be intriguing to discuss in class. Lighting is a very interesting phenomenon. Scientists have been studying its origins for centuries. Recently they have begun to discover some pretty weird things about lightning, quantum mechanics, and cosmic rays. Very intriguing subject indeed, José. Technology and science have given this guy another chance at trying to live a normal life again. It’s sad to see someone having to go through that but then again, he is very positive about it and hopefully he can keep living his life with his new arms. While scrolling down on the blog i found this old post and remembered when you showed us this video at the beginning of august. This video catched my attention a lot. It was very impressive to see how technology has evolved in such a way that a man could have a second chance on having a normal life or at least something similar to what he had before. It is very moving to see this man be able to complete daily tasks that otherwise he would not be able to complete. I would love to see technology make humans life simpler, yet i believe sometimes technology make us sluggish people. It makes us try to avoid simple tasks and make them “simpler”. In conclusion i found this link very interesting and innovative. An amazing breakthrough in robotics. It is very amazing to see that with a simple app you can move and control an arm. With that, life would be simpler and it would help a lot of people. Over the years, technology has helped us and made our lives easier. If right now we have this technology, imagine in the future how we will have many other things that will help us in our daily lives. It is extremely impressive how technology could give back so many positive outcomes for us humans. Many criticize and question whether the fast development of technology is truly healthy and helpful for us, and it takes captivating stories like this one to actually make us understand how fortunate we are to have this developing technology. Humans can be defined with limitations and I believe this is our only remedy that can help us surpass any obstacle or difficulty in life. With technology progressing at its fast rate, what could stop us in the future? “With technology progressing at its fast rate, what could stop us in the future?”<—-According to the history of thought of the last 3,500 years–which include Greeks, Romans, Chinese, the whole planet–, nothing will stop us. And I'm totally fine with that. Cyborgs are not exclusive of sci-fi narratives. Wow, I saw this exact post o YouTube a few months ago and I was shocked. I can’t believe how fast technology is advancing. And I’m so happy because thanks to this people that have suffered axidents in which their hands where damaged, they can continue a normal life.